A dog’s head hanging out of the car window, ears flapping recklessly in the wind and tongue tumbling lopsided out of his mouth, paints about as pure a picture of happiness as there ever was. With little clue as to where she is going, other than the hundreds of scents her wild nose whiffs along the way, the destination doesn’t matter. Anywhere she can race around in circles, discover new smells and encounter either four-legged or two-legged friends is a welcome terminus. Whether it be a quiet suburban street, or a noisy park teeming with new sights and smells, most dogs aren’t too particular. Of course, not all dogs are born adventure-seekers. Some need a bit of extra encouragement to fulfill their breed’s ambition as a herding dog, or retriever, when this genetic instinct fails to kick in. On a vacation in Maine, we went on a hike with our dog Molly and stopped at the water to see if she would swim. As a labrador retriever, it seemed natural that she might go in the water, and that throwing sticks in might invite her to venture out and retrieve them. My dad threw one stick close by, a few yards from where we stood in the sand. “Come on, Molly. Go get it. Atta girl, Come on Molly,” everyone cheered for her. Her gaze shifted from her crowd of supporters to the distant stick, then she cautiously waded into the surf where her paws and lower legs got wet. She was caught between wanting praise from her family if she could proudly carry the stick ashore and her distaste for the getting her body wet. She was leaning toward the latter option when my mom had the idea of throwing bits of a granola bar into the water. That got her attention. As soon as a morsel of granola plunked into the water, she was off, not letting a second waste where she could loose sight of her treat. After we’d used up our supply of granola bars, the water was no longer an enticing option. Of course, some animals are more cosmopolitan, preferring to promenade along the bustling streets than to get their paws a little sandy. Our dog was one of these; the type who would lick the insides of a yogurt container as you held it, or who more than occasionally was served scraps of eggs in her dog food dish. She had no problem staking out her desired seat on the couch. If I sat in her spot, next to my mother, she would just plop her ninety-pound body on top of me until I was forced to scoot down. She was also blessed in having a good sense of logic. Early on in her training as a puppy, my parents had an “invisible fence” installed, consisting in an underground wire and shock collar for the dog to wear which would prevent her from leaving the yard. 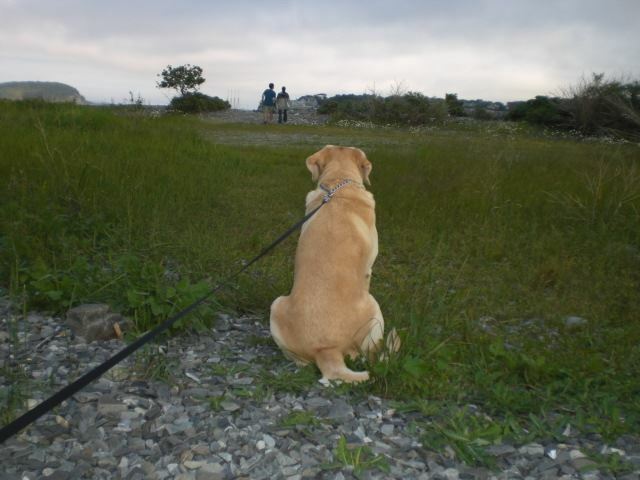 A smart and sometimes obedient girl, Molly stayed in the yard for the most part. She understood the workings of the invisible fence, but once in a while an extenuating circumstance would present itself. For instance, an empty bag of potato chips which had been blown into the middle of the road was too delicious a treat to pass up. On these occasions, she would bolt through the fence, probably thinking to herself that the shock would be worth that greasy plastic bag. “Life’s hard without a dog,” said my mom. “You got through life fine before we had a dog,” my dad says. One never understood the crazy obsessions of people until you became “one of those.” Like the subculture of Dog-Owners Who Treated Animals Like Children, monitoring their pets at doggy-day-care on hidden cameras to make sure they behaved or purchasing gourmet treats for their pets from specialty “doggy boutiques.” These behaviors might have seemed excessive, but you somewhat understood if you had a dog yourself. “That’s ‘cause you don’t realize what you’re missing before you know a dog’s company.” It’s hard to adapt to actually having to bend over to pick up a cheerio when it drops to the floor instead of waiting for her cleaning supply of a tongue to lap it up in one swift motion or not having an oversized yellow nose to rest in your lap while you watch TV. Somewhere, a ways down the road, in the back of your mind, looms the day when that four-legged member of the pack won’t be around anymore. Dog owners are sentimental folks because they know going in that their animals won’t last as long as they will. Even after my dog is gone, there are still little yellow hairs on the sleeves of my black NorthFace fleece that don’t come off no matter how many times I take the lint-roller to it. There’s fog from her hot, smelly breath still on the glass sliding doors from where she would sit and look out the window. I’m missing something when I don’t see the pink tip of her nose creep through the front blinds, waiting, as the car pulls in the driveway. Then once she spots us, abandon her post and run to the garage door ready to bark for a treat. But people have a few things in common with their pets. Just like a dog who hangs her head out the car window, surrendering to the smells of garbage, fast food, other animals, letting her ears flutter in the breeze; her owner seems to know as well that the end won’t matter as much as the ride did. Awwww, I miss my Molly. She was the best! Great story!